Salak trees are covered in sharp spikes, so harvesting the fruits takes skill. After retrieving a morsel, hungry harvesters will typically open it by pinching the tip to break the skin, then peeling against the grain of the scales. Inside is a hard, pale yellow pulp that breaks apart into three lobes resembling large cloves of garlic. A properly ripened snakefruit is dry and crunchy, with a taste similar to a bitter pineapple or jackfruit. The pulp is commonly eaten raw, but is also used to make wine, juices, and candies. Most varieties of salak have an astringency to them, which is something that can take getting used to. There is a thin film surrounding each lobe of pulp, which, if peeled, can remove some of the astringent taste. However, some consumers of the fruit swear that leaving that thin membrane intact will help keep you regular. But not too much: Excessive consumption of snakefruit is said to cause constipation. 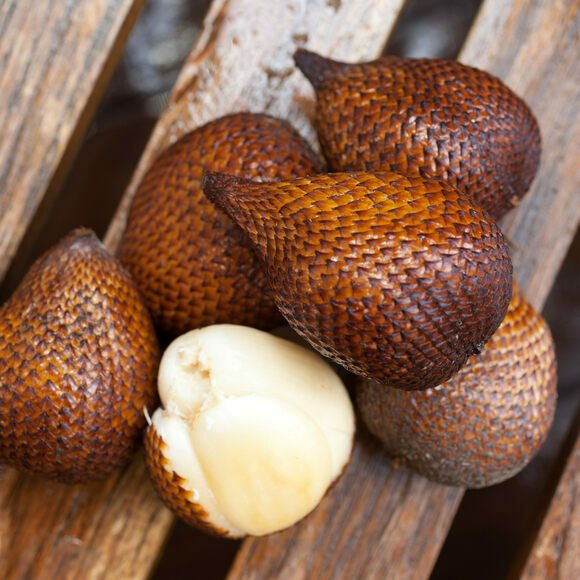 Despite its challenges, salak is much loved throughout Southeast Asia and can also be found for sale in China and Australia. In Thailand, another species of snakefruit known as "Salacca wallichiana" is preferred. Locally known as “sala,” this variety is similar in taste but with less astringency and a juicy texture. Take the hottest pepper on the planet, multiply it by 10, and you have Jakarta's intensely spicy dish. It looks like an exploding planet and tastes like sugarcane.